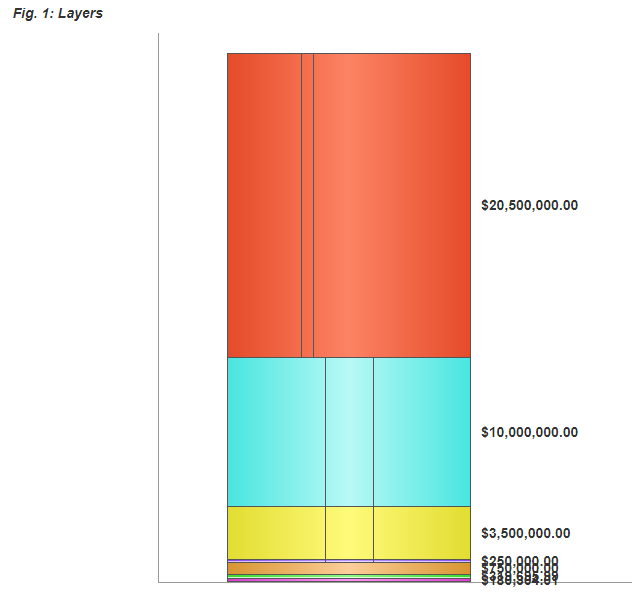 As you can see, the layers at the bottom of the graph have dollar amounts that are too small to show their labels without them overlapping. What's the best way to compensate for this so that the bottom of my graphs are easier to read? Set up a minimum layer height so that the labels can't overlap. This looks the best but requires me to squish the remaining layers to make everything fit and so the graph is no longer accurate. When a layer is too short, stagger the labels so they don't overlap. This is better than them overlapping but still doesn't look great IMO. Remove the labels altogether and place them in a separate key/legend based on color. This is a clean solution but I already have the labels for the vertical slices separated into a key and I'm worried that the more I remove from the actual graph, the harder it is to interpret and therefore loses some of its value. Alternatively you could implement something like a magnifiyng glass to show the small amounts. I first thought about tool tips on hover but a amount could be so small, that the height of an amount is just one pixel an therefore not easy to hover over. You have several visualization problems to solve in one graph. How are the users interacting with this? 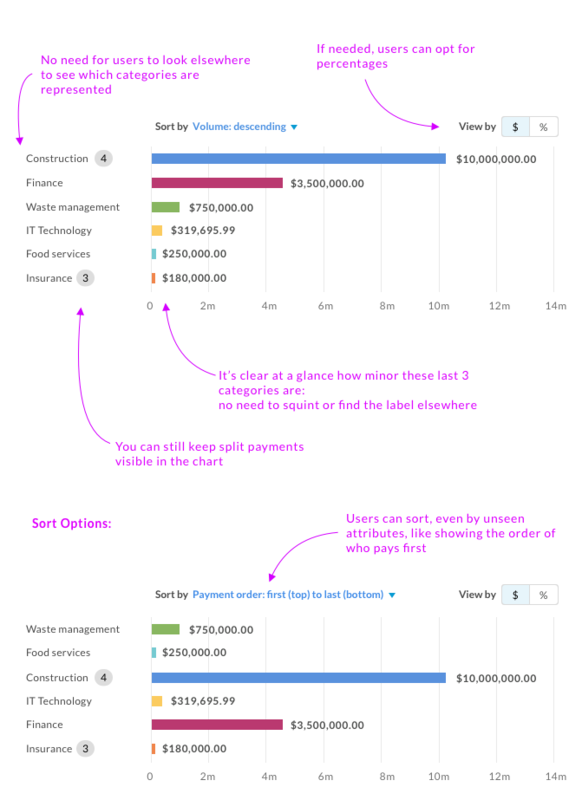 Your question is focused mostly on labels, however, you also mentioned showing when an element is being split among several entities for payment, in addition to showing sequence of payments. So you have a stacked bar - like graph doing some heavy lifting. 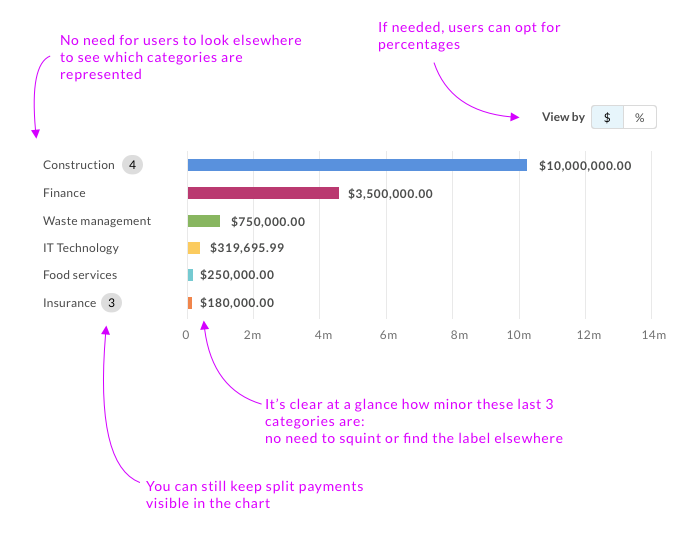 I don't know your whole use case (and constraints), but you might consider altering the visualization type. 1. Consider a table for comparative values, and ability for sort and drilldown. There are some tradeoffs (such as maybe more reading than a visual gestalt), but it brings data forward in a sortable fashion, and can show small % categories w/o eyestrain or interpretation. 2. Or, try a horizontal bar chart. In the stacked area example, users have to use height to see magnitude comparison at a glance. 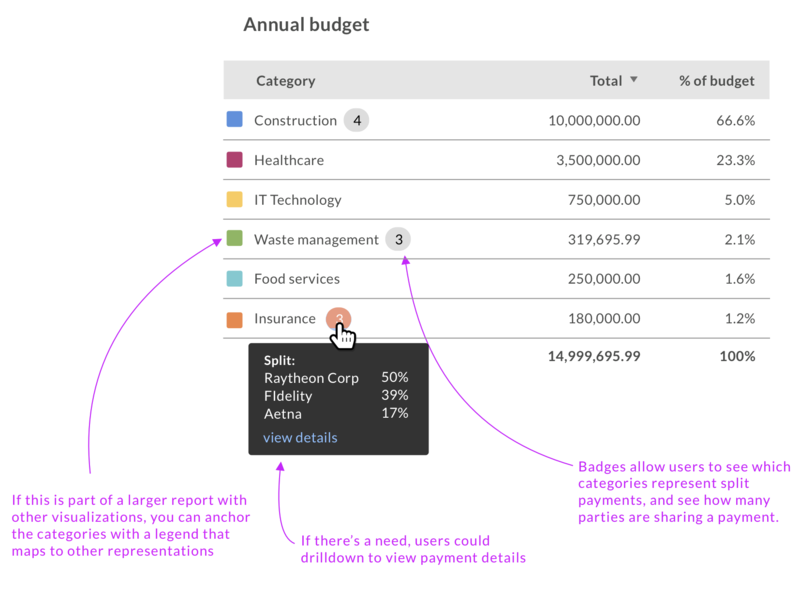 With a horizontal chart, you can take advantage of humans ability to assess values by length. You can empower exploration by a sort control above the table. Visual perception is highly tuned for seeing differences among the lengths of objects that share a common baseline but not well attuned for discerning differences among 2-D areas. You can try a combination of several types of charts and drill-down functionality. Not the answer you're looking for? Browse other questions tagged info-visualisation labels charts or ask your own question. How do you provide interaction in plots and graphs on touch devices?